Costa Rica has a wide variety of animals not typically found in Chicago*, and that was probably my favorite part of the trip. There’s just something about seeing a big honking crocodile cruising off the side of your boat, that’s a bit different from seeing one in the zoo. The most exciting part was when we *almost* saw a crocodile eat an iguana. There had been a bunch of iguanas on a rock, when they nervously started running for the shore, one by one. Our guide pointed out the crocodile that was stealthily creeping up on their position and spooking them out. Finally it got right up to the rock and only one lonely iguana remained. By this time we had drifted downstream, so we unfortunately did not get to see the exciting conclusion to this little tale, but all I know is that when we came back the other way, the iguana and crocodile were both gone. We’ll never know for sure what happened, of course, but as for me, I’d like to think that the iguana hulked out and ate that crocodile for lunch. 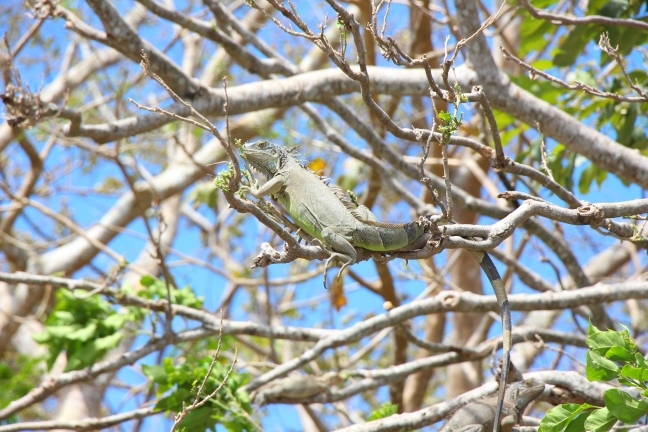 These iguanas, man. They were everywhere. They’re like the Costa Rica equivalent of a squirrel. You couldn’t throw a crocodile without hitting one. On the beach, in the resort, in the trees…you name it. Unlike cute, cuddly squirrels, however, they’re ENORMOUS REPTILES WITH WHIPS FOR TAILS, SPIKES ON THEIR BACKS, AND A HUNGER FOR HUMAN FLESH. 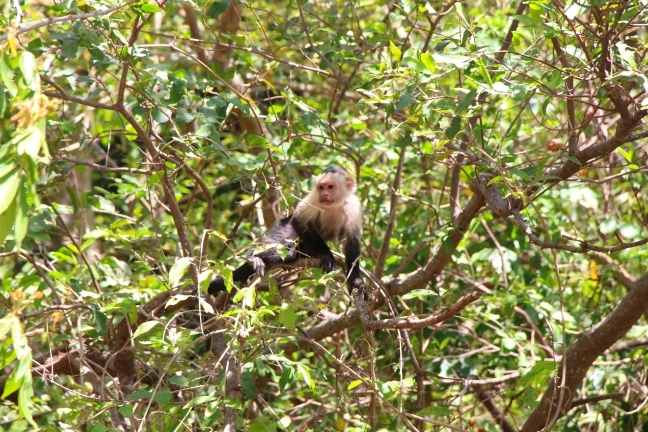 Costa Rica also has monkeys, which, as we all know, are the coolest possible animals. Everything they do is amazing. Up to, and including, almost getting eaten by a crocodile. See, sometimes these cute little capuchin monkeys have to go down to the river to drink. So they run down their cute little branches with their cute little monkey hands and lean over with their cute little monkey faces and get snatched up in the pitiless jaws of a giant, prehistoric apex predator. Alas, not today (2nd missed chance to see something get eaten by a crocodile). Apparently, the monkeys have learned to scan the water for a few minutes, then scamper down and slap their tail in the water before high-tailing it (literally) back into the trees to lick the captured water. The monkeys did immediately delight us by doing what comes naturally, if you know what I mean, which SOME members of our party found just unendingly hilarious, even if I personally think it would have been cooler to see a crocodile do what comes naturally, if you know what I mean. 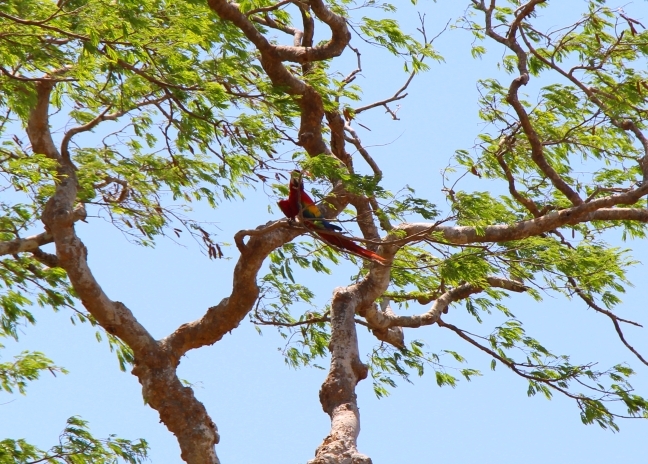 Also, there was a scarlet macaw. We saw a few other things, like howler monkeys, bats, and lots of awesome birds, including a super-endangered stork thing that is roughly the size of my 7 1/2 year old. On the second day we went on a rainforest hike, where we learned that “rainforest” is not just a clever name. No, in fact, it is a forest. A very, very rainy forest. My motivation for hiking in the rainforest was to see lots of animals. Unfortunately, we didn’t see a single animal. Turns out that animals think it’s kind of stupid to hike around in the rain. Even the leafcutter ants stayed inside. 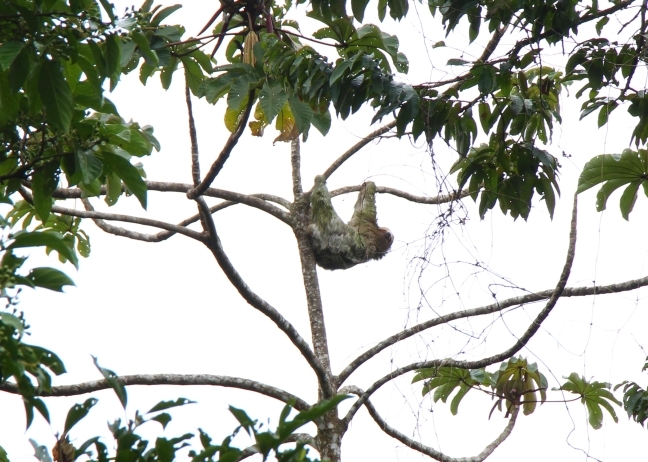 But we did see a sloth, so actually that was pretty cool. 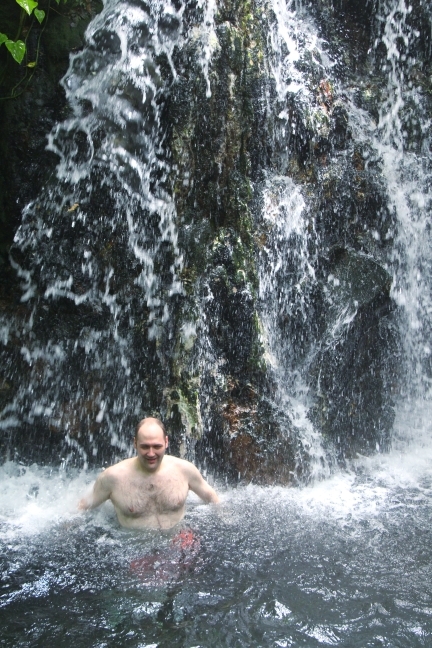 The rainforest was not a complete waste of time, however, because I got to swim under waterfalls, which was *awesome*, and float in a volcanic-heated hot spring, which was also *awesome*. Oh, and my sister got married (3rd missed chance to see something get eaten by a crocodile). I looked at this and was like… wow, I don’t remember getting into a waterfall.